You are inspired by history. Recollections is the destination to shop for your next special event or production. Our large selection of history-inspired women's clothing is designed and made in the USA. 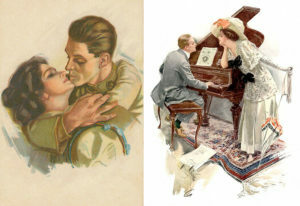 While we specialize in Victorian (including Civil War, Old West and Pioneer) and Edwardian era designs, we have a wide variety of styles from the Revolutionary War/Georgian and Regency eras, the Roaring 20s, and 1950s, too. We also offer a full selection of hats and other accessories to help you complete your look. We're only a phone call or email away when you want or need assistance. We're always happy to answer your questions and to help you during the ordering process. Need it customized? We make bodice, sleeve, torso, and skirt length adjustments for a nominal charge. We can also accommodate most requests for a change in fabric. Cost varies by desired fabric. Request swatches to help you decide. We also combine compatible styles for an additional charge. Your order matters! Our fashions are designed and made in the United States, but our customers live all over the world. Order one garment or order for all your employees/cast members. Choose rush processing for an additional fee if you need it in a hurry. Recollections' designs appeal to a wide variety of period clothing enthusiasts including those desiring a wedding with that special timelessness; members of SASS, CASS, and NCOWS who want to look their competitive best; historical reenactments; museum exhibits and docents; historical site staff; costuming for film, TV, and stage; horse-drawn carriage tours; history walks and ghost tours; ballroom dancing; historical period celebrations; and LARP events and conventions. So, welcome to the Recollections family! We invite you to subscribe to our newsletter, connect with us on Facebook, Twitter, or Instagram, visit our Pinterest boards, and peruse our blog.